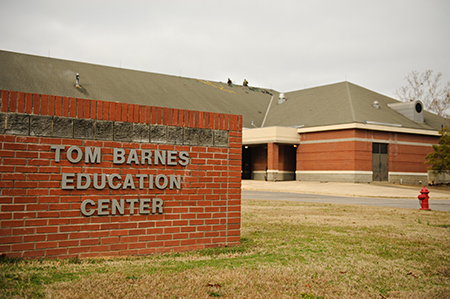 In 2014, the College of Education acquired the Tom Barnes Education Center after the University purchased the Bryce campus. Tom Barnes was an aide to Alabama Sen. Richard C. Shelby. He came to Washington in 1990 and rose from an intern to a full staff member for Mr. Shelby in just six months. Barnes was murdered in 1992. He was 25. 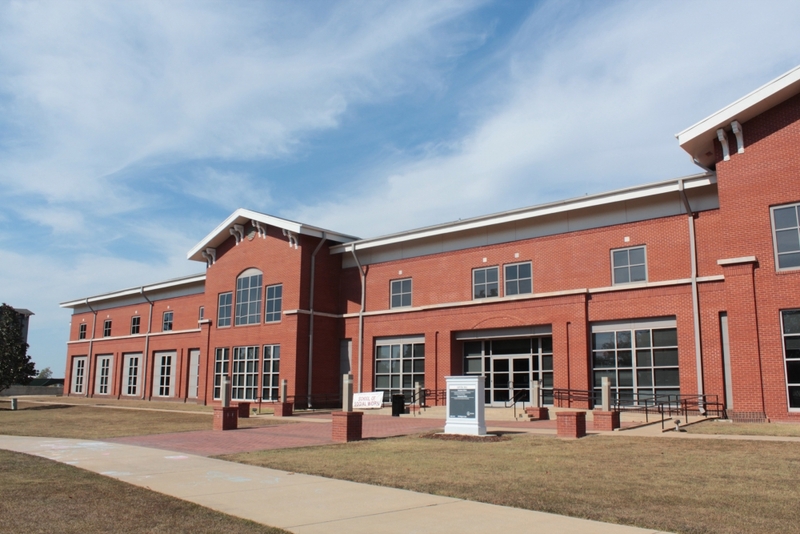 The UA In-Service Education Center, Multiple Abilities Program, CrossingPoints, Belser Parton Literacy Center, and the state office of AdvancEd are all now in the Tom Barnes Education Building. 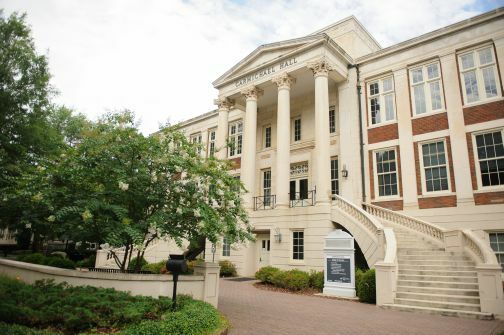 Since 2017, Capital Hall houses the educational neuroscience faculty and the Institute for Educational Neuroscience as well as Office of Evaluation Research and School Improvement. The Institute for Educational Neuroscience includes the Center for the Study of Ethical Development, the Embodied Learning Design and Educational Neuroscience Lab, the Education & Cognitive Science Lab, the Neuromodulation Processes and Virtual Reality Lab, and the Social, Emotional and Educational Neuroscience Lab. It is the mission of the Office of Evaluation Research and School Improvement to provide high quality evaluation services that will improve translation into practice. They provide comprehensive monitoring, evaluation, and measurement services to determine the impact of education, training, and community programs across the state and the nation to inform and improve decisions and policy. 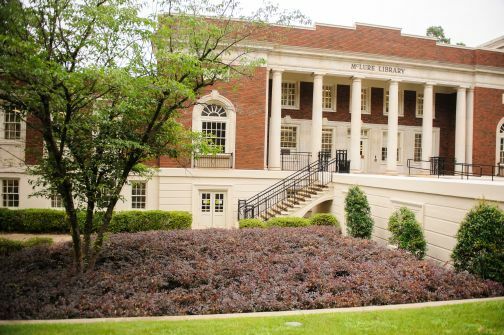 The first Amelia Gayle Gorgas Library (now Carmichael Hall), built in 1925, was intended to serve as a temporary library until funds to erect a larger structure could be secured. It was then to be converted into an administration building. Initially, only the lower floor was used for administration. The building is similar in scale and design to Nott Hall, directly across the Quadrangle. 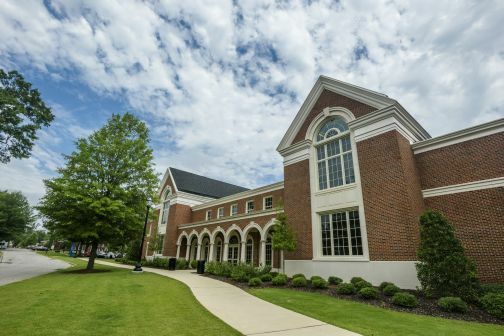 The upper two floors housed the library until the completion of the Amelia Gayle Gorgas Library. It had a capacity of about 60,000 books in stacks kept closed to students. The general reading room, containing current, occupied the whole front section of the third. After the library was moved to its new quarters in 1940, the building served as the administrative headquarters for the University until the construction of Rose Administration Bulding in 1969. In 1971 the old building was renamed Carmichael Hall in honor of President Oliver Cromwell Carmichael. Following extensive renovations in 1995, Carmichael Hall became the home of the College Dean’s office on the second floor. The Financial Affairs office, the College and Alumni Relations office, the Capstone Education Society, and the Office of Development are also housed on the second floor. The programs in educational and school psychology and educational research are located on the third floor, and the Office of Student Services and the Office of Research and Service are located on the first floor of this three-storied building. In 1927, President Denny and Dean Doster asked Professor McLure to assist with the plans for expanding and reorganizing the School of Education. It was McLure who was largely responsible for the creation of the College of Education. He collaborated, especially with Professor Ralph W. Cowart, in the design of Bibb Graves Hall. McLure suggested that the passage from the Ordinance of 1787 grace the stone entablature above the building’s main entrance. In 1928 the ground was broken by Dean James J. Doster and President George H. Denny for the construction of Bibb Graves Hall. The three-storied brick, stone, and slate structure was formally opened on June 21, 1929. The wing containing the auditorium was added to the original 60,000-square-foot building in 1939. A major renovation of Graves Hall was completed in 2006. Today, the building houses regular classrooms, technology classrooms, and science laboratories. Additionally, the building houses the Office of Clinical Experiences and the programs and faculty offices for curriculum & instruction; special education and multiple abilities; educational leadership, policy, and technology studies; and counselor education. 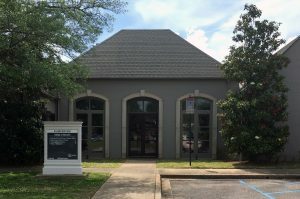 Since 2016, the Hillard Building houses the Alabama Behavior Support Office as well as parts of CrossingPoints. McLure Library, built in 1925 by Miller, Martin, and Lewis, was originally the university post office and supply store. In the late nineteenth century, the former had been operated out of one of the lower floor rooms in the Gorgas House by Postmistress Ameilia Gayle Gorgas, and later it was moved to the first floor of Woods Hall. The “new” Post Office in McLure Hall and the soda fountain in the University Supply Store were popular meeting places for students in the 1920s and 1930s. The basement of the structure housed a large student cafeteria that took over the functions of the old dining room in Woods Hall. According to Dean McLure, during the 1952-1953 academic year, the single most important activity of the College was the work conducted by committees on the plans to alter the University’s cafeteria to serve as the College’s library. The plans included a main reading room, a periodical room, a graduate reading room, a cataloging room, and a five-floor stack room with a book capacity of 100,000 volumes. The basement would house the curriculum laboratory, and the top floor was slated for the Department of School Library Service. The building, which became the education library in 1953 was named in honor of Dean John Rankin McLure in 1975 who served as Dean of the College of Education from 1942 to 1959. The music education program is housed in the Frank Moody Music Building. The building contains both the choral music and the instrumental music programs. The School of Music had long outgrown its quarters in the Music and Speech Building when plans to erect a large new building were first envisioned. It was originally intended to be built in the northwestern section of campus as part of the liberal arts grouping of buildings proposed by the 1961 Greater University Development Plan. With the acquisition of land on the east side of campus in the 1970s, a new site was selected and construction was begun on the building in 1986. The Frank Moody Music Building is named after a prominent Tuscaloosa banker and benefactor of the University. Woollen, Molzan and Partners of Indianapolis, and Fitts and White Associates of Tuscaloosa were the architects. A nationally known acoustic consultant, Lawrence Kirkegaard, assisted. The unusual design is a departure from the traditional Classical Revival style of the central campus and from the modern style of the Ferguson Center and the Law Center. The architects used the victorian campus buildings as their source of inspiration and freely interpreted such elements as steeply pitched gables, unusual window shapes, and Victorian asymmetry. The building’s showpiece, however, is a 1,000-seat concert hall patterned after the home of the Vienna Philharmonic. Moore Hall was constructed in 1935 as an addition to Little Hall. The buildings are attached by a short portico. Little Hall, named after William Gray Little, the student who introduced football to campus in 1892, was constructed in 1915 as a “great gymnasium” (Crimson-White, May 1909). Also a gymnasium, Moore Hall was named in honor of A. B. Moore, the first dean of The University’s Graduate School (1925-1958) and President of the National Collegiate Athletic Association (1951-1952). Currently, Moore Hall houses the offices of the Department of Kinesiology. 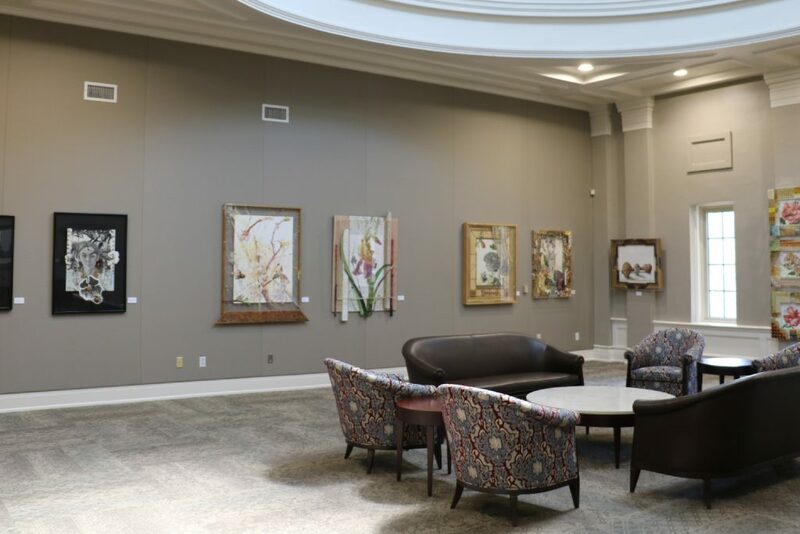 Acclaimed multi-medium artist and University of Alabama alumnus Fred “Nall” Hollis donated a collection of etchings and other works to the College. 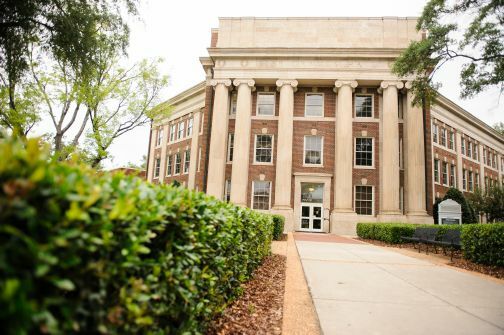 Hollis, known professionally as “Nall,” donated artwork valued at more than $540,000 to the UA College of Education, which is displayed on the third-floor rotunda of Carmichael Hall. Nall served as artist-in-residence at UA in 2000 and helped bring Alabama’s arts community to national notoriety through the traveling exhibit – and book – “Alabama Art,” a collection of portraits of 12 Alabama artists and their works. Nall is currently based in Fairhope after spending a great part of his career in France, where his Nature Art and Life League (N.A.L.L.) 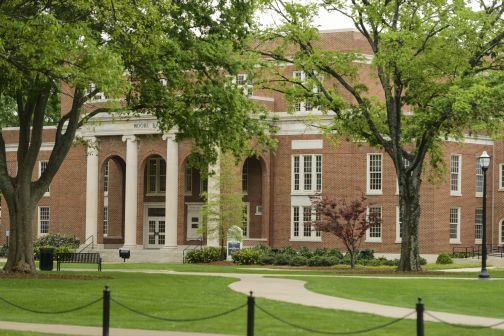 offered apprenticeships to international students, some from UA. Nall, born and raised in Troy, earned a bachelor’s degree in art at UA in 1970. A year later, he moved to Paris, France to study at its Ecole National des Beaux Arts (School of Fine Arts). He’d travel across Europe, the Middle East, Asia and Mexico, learning different mediums from the likes of Spanish surrealist artist Salvador Dali, who influenced his etchings, some of which will be on display at UA. Nall developed a reputation for producing art in many mediums, particularly mosaics, sculpture and line engravings. He’s also created porcelain designs for Haviland, Royal Limoges, Monaco and Tunisian porcelain, and he makes tapestries and opera set and costume designs. His artwork has been displayed in art museums across the United States and internationally in Monaco and the Vatican, among others. The Stran-Hardin Arena, a $10 million multi-purpose facility for UA’s Adapted Athletics program, is a two-story facility, named for Drs. Brent Hardin and Margaret Stran, founders of the program. It includes a NCAA regulation game venue for wheelchair basketball, locker rooms, athletic training room, strength and conditioning room, team meeting rooms and study halls. 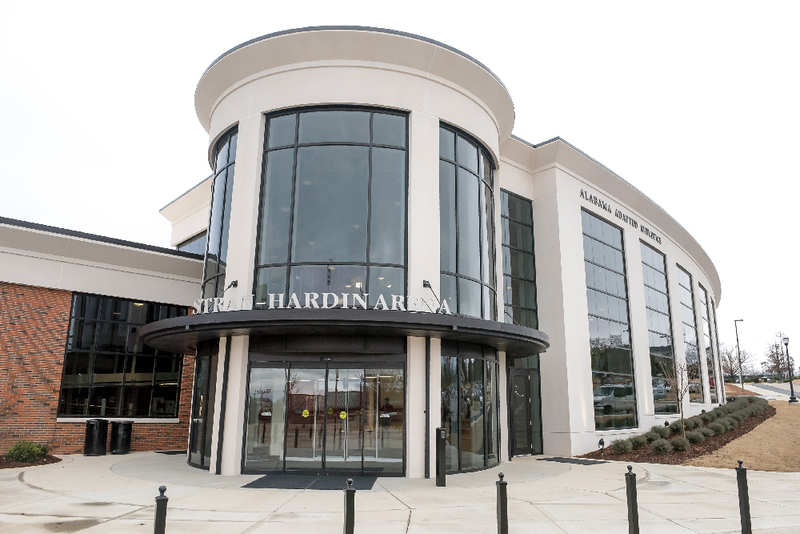 Stran-Hardin Arena is along the south façade of the UA Rec Center, east of the main entrance. UA Adapted Athletics began in 2003 with women’s wheelchair basketball. The program has since grown to include women’s basketball, men’s basketball, wheelchair tennis, para-rowing and adapted golf. UA is home to seven national championships in men’s and women’s wheelchair basketball (2009, 2010, 2011, 2013, 2015, 2017, 2018). Wheelchair tennis has won four national championships (2013, 2015, 2017, 2018).